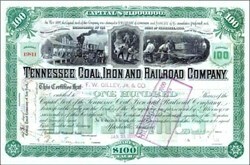 Beautifully engraved stock certificate from the Tennessee Coal, Iron and Railroad Company issued no later than 1901. This historic document was printed by the American Banknote Company and has an ornate border around it with a triple vignette of a train and men working in a mine. This item has the hand signatures of the Company�s officers. The certificate has been punch cancelled through the signatures and is in EF Condition and is over 116 years old. Certificates from the Original Dow Average Company are quite desirable and very collectible. Beginning in the 1870's, blast furnace complexes spread throughout north Alabama, supplied with raw materials from nearby iron ore and coal mines. 1881 The Tennessee Coal and Railroad Co. was renamed to the Tennessee Coal, Iron and Railroad Co. in 1881. The Tennessee Coal, Iron, and Railroad Company was one of the largest industrial firms in the Birmingham area. Ultimately, the company was acquired by U.S. Steel in a merger in 1907 which was approved by Teddy Roosevelt when he was tricked during the panic of 1907 by J. P. Morgan.